In 2011 my new years resolution was to build a game and put it into the app store. By January 2012 I still hadn’t finished it. It wasn’t through lack of trying, I just bit off more than I could chew; using a Mac for the first time, learning a new programming language (lua) and producing illustrations which stretch my ability to draw. In mid January I started to think that I could make something much simpler and use the technologies I’m more comfortable with (HTML, JS and CSS). After a some lame ideas (a sheep piano, goat organ and cow-a-phone), some ideas that had been done many times (drawing a perfect circle and being scored on it), I finally had the idea of a game where you guess what the iPad is drawing. 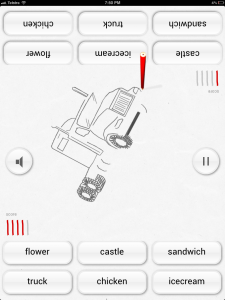 This idea has become Doodle Duel (name thanks to Dav), a competitive game for 2 players to be played in the style of an old 1980s cocktail video game. 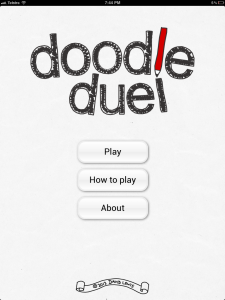 Doodle Duel is built using web technologies with a little help from PhoneGap – where the browser doesn’t quite have the functionality yet (I’m looking at you Audio API). The illustrations were produced with Ink Scape, then rendered to the screen using Canvas. I’d done some rough tests last year with a SVG/Raphael (if you haven’t used this before… do it) drawing the paths, but I found the performance suffered as the drawings became more complex. The conversion to Canvas seems to keep the drawing speed consistent, regardless of the complexity (even on iPad 1). The app that has been submitted to App Store weighs in at around 4mb, fairly small for an iPad app. I was quite conscious of keeping it well under 20mb, as this is the limit for a 3G download when purchasing the app, and I like the idea that people might want to download it for a road trip, or a rainy holiday day. I’ve never been so paranoid about a personal project. Checking everything a million times, and annoying people by asking them to play and watching out of problems. I read and re-read the guidelines, searched for checklists that people use, anything to help me ensure the app was acceptable. The final process for building the app for release drove me a little nuts, Apple have a guide on their site, but I also found the guide by Steve Gill invaluable. To get an idea of how long the game will take to finish it’s review, I’ve been keeping an eye on http://reviewtimes.shinydevelopment.com/ which uses crowd sourcing via Twitter to calculate approval times.